کرامت سیاوش, نعمت, نجفی, غلامحسن, حسن بیگی, سید رضا, قبادیان, برات. (1395). تحلیل فرکانسی اثر مخلوط سوخت‌های دیزل و بیودیزل بر صدای یک موتور تک سیلندر دیزلی. مجله صوت و ارتعاش, 5(9), 13-22. نعمت کرامت سیاوش; غلامحسن نجفی; سید رضا حسن بیگی; برات قبادیان. "تحلیل فرکانسی اثر مخلوط سوخت‌های دیزل و بیودیزل بر صدای یک موتور تک سیلندر دیزلی". مجله صوت و ارتعاش, 5, 9, 1395, 13-22. کرامت سیاوش, نعمت, نجفی, غلامحسن, حسن بیگی, سید رضا, قبادیان, برات. (1395). 'تحلیل فرکانسی اثر مخلوط سوخت‌های دیزل و بیودیزل بر صدای یک موتور تک سیلندر دیزلی', مجله صوت و ارتعاش, 5(9), pp. 13-22. کرامت سیاوش, نعمت, نجفی, غلامحسن, حسن بیگی, سید رضا, قبادیان, برات. تحلیل فرکانسی اثر مخلوط سوخت‌های دیزل و بیودیزل بر صدای یک موتور تک سیلندر دیزلی. مجله صوت و ارتعاش, 1395; 5(9): 13-22. بیودیزل سوختی است که از پسماند‌های روغنی محصولات کشاورزی و صنایع غذایی و یا بصورت محصول اصلی دانه‌های روغنی مثل کرچک تهیه می‌گردد. نوع سوخت تاثیر مستقیم بر پدیده احتراق موتورهای احتراق تراکمی (IC) دارد. یکی از مهم‌ترین پارامترهای کیفی کارکرد موتور که در اثر نوع سوخت تغییر می‌کند، صدای موتور می‌باشد. تحقیق حاضر جهت بررسی تاثیر سوخت بیودیزل بر روی صدای موتور انجام گرفت. صدای موتور تک سیلندر دیزلی با استفاده از هفت مخلوط متفاوت سوخت گازوئیل و بیودیزل اندازه‌گیری شد. نتایج نشان داد که فرکانس غالب صدای موتور Hz 315 و با منشا احتراق و ساختار اگزوز می-باشد. در این فرکانس تراز فشار صدای موتور با سوخت B10، 23 % کمتر از سوخت B30 (مخلوط 30 درصد بیودیزل و 70 درصد سوخت گازوئیل) بود. کمترین صدای تولیدی موتور در مخلوط سوخت B10، و بیشترین صدای تولیدی در B30 اتفاق می‌افتد. Dewangan, K. N., G. V. Kumar, V. K. Tewari. “Noise characteristics of trctors and health effect on farmer.” Department of Agricultural Engineering, North Eastern Regional Institute of Science. 2005. Hong, Zh. J., H. Bing. “Analysis of engine front noise using sound intensity techniques.” Mechanical Systems and Signal Processing 19و 2005, pp. 213-221. 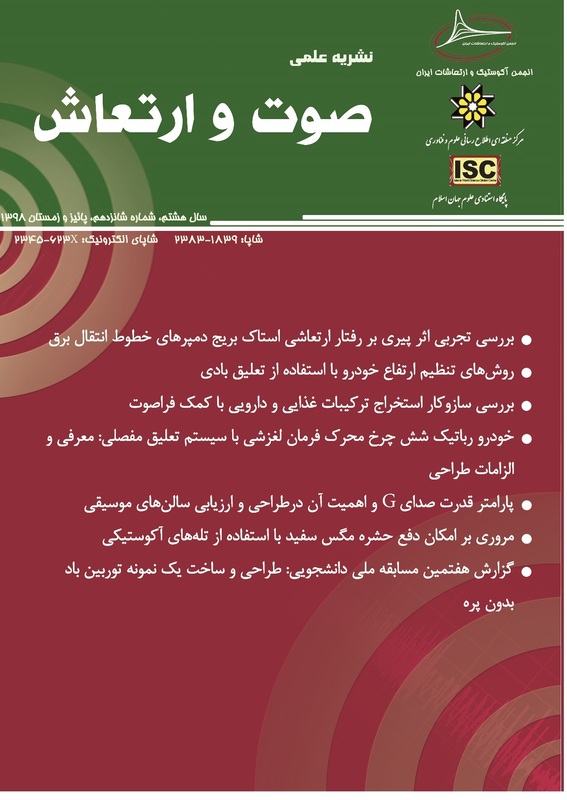 Hassan-Beigi, S. R. “Investigation and Analysis of Power Tiller Noise”, PhD Thesis, TMU, Tehran, Iran, 2003. Guangpu, L., B. Shihua, P. Hongxia. “Analysis of Noise Characteristics for Diesel Engine.” 1-4244-0529-7/06 IEEE. 2006. Hassan-Beigi, S. R., B. Ghobadian. “Noise attenuation characteristics of different road surfaces during power tiller transport". Agricultural Engineering International, 2005. Pruvost, L., Q. Leclere, E. Parizet. “Diesel engine combustion and mechanical noise separation using an improved spectrofilter.” Mechanical Systems and Signal Processing 23(7), 2009, pp. 2072-2087. Yoshida, T., R. Miyamoto, M. Takada, K. Suzuki. “Adaptive noise canceller”, Google Patents. 1995. Bhattacharya, M., B. Ghobadian, S. C. Jain, N. Singh, P. S. Mehta. “An estimation of combustion and mechanical noise components of a small DI diesel”, Proceeding of the National Symposium on Acoustics, Madras, India, 1992. Taghizade, A. “Parametric Investigation of Vibration Signals for MF 399 Tractor Using Diesel and Biodiesel Fuels.” PhD thesis. TMU, Tehran, Iran, 2012. Albarbara, A., F. Gub, A. D. Ball. “Diesel engine fuel injection monitoring using acoustic measurements and independent component analysis.” Measurement 43, 2010, pp. 1376-1386. Anyu, C., J. Jide, D., Xiliang, Z. Andzhongkui. “Transient Sound Visualization and Application to Analysis of Engine Acoustic Characteristics by Continuous Wavelet Transform”, Third International Conference on Measuring Technology and Mechatronics Automation, IEEE 978-0-7695-4296-6/11. 2011. Giakoumis, E. G., A. M. Dimaratos, C. D. Rakopoulos. “Experimental study of combustion noise radiation during transient turbocharged diesel engine operation.” Energy 36, 2011. Rakopoulos, C. D., A. M., Dimaratos, E. G. Giakoumis. “Study of turbocharged diesel engine operation, pollutant emissions and combustion noise radiation during starting with bio-diesel or n-butanol diesel fuel blends.” Applied Energy 88, 2011, pp. 3905-3916. Rossing, T. D., Springer Handbook of Acoustics, Springer, 1st edition, 2007. Anonymous. “Operator ear sound level measurement procedure for small engine powered equipment.” SAE J1174. 1985. Anonymous. “Acoustics: Tractors and machinery for engineering and forestry.” Measurement of noise at operator’s position, ISO 5131, 1996. Anonymous. “National stationary exhaust noise test procedures for in-service motor vehicles”, National transport commission on behalf of the land transport environment committee, 2006. Suggs, C. “Noise characteristics of field equipment.” American Society of Agricultural Engineers, 1987. Harrison, M. “Vehicle Refinement Controlling Noise and Vibration in Road Vehicles.” SAE International press, 1st edition, 2004.